Aphids are small sap-sucking insects and members of the superfamily Aphidoidea. Common names include greenfly and blackfly, [a] although individuals within a species can vary widely in colour. The group includes the fluffy white woolly aphids. A typical life cycle involves flightless females giving living birth to female nymphs without the involvement of males. Maturing rapidly, females breed profusely so that the number of these insects multiplies quickly. Winged females may develop later in the season, allowing the insects to colonise new plants. In temperate regions, a phase of sexual reproduction occurs in the autumn, with the insects often overwintering as eggs. The life cycle of some species involves an alternation between two species of host plants, for example between an annual crop and a woody plant. Some species feed on only one type of plant, while others are generalists, colonising many plant groups. About 5,000 species of aphid have been described, all included in the family Aphididae. Around 400 of these are found on food and fibre crops, and many are serious pests of agriculture and forestry, as well as an annoyance for gardeners. So-called dairying ants have a mutualistic relationship with aphids, tending them for their honeydew, and protecting them from predators. Control of aphids is not easy. Insecticides do not always produce reliable results, given resistance to several classes of insecticide and the fact that aphids often feed on the undersides of leaves. On a garden scale, water jets and soap sprays are quite effective. Natural enemies include predatory ladybugs, hoverfly larvae, parasitic wasps, aphid midge larvae, crab spiders, lacewing larvae, and entomopathogenic fungi. An integrated pest management strategy using biological pest control can work, but is difficult to achieve except in enclosed environments such as glasshouses. Aphid giving birth to live young: populations are often entirely female. ^ The term "black fly" is also used for the Simuliidae, among them the vector of river blindness. ^ Dairying ants also milk mealybugs and other insects. ^ Piper, Ross (2007). Extraordinary Animals: An Encyclopedia of Curious and Unusual Animals. Greenwood Press. pp. 6–9. ISBN 978-0-313-33922-6. ^ a b Żyła, Dagmara; Homan, Agnieszka; Wegierek, Piotr (2017). "Polyphyly of the extinct family Oviparosiphidae and its implications for inferring aphid evolution (Hemiptera, Sternorrhyncha)". PLOS One. 12 (4): e0174791. doi: 10.1371/journal.pone.0174791. PMC 5405925. PMID 28445493. ^ Berry, R. E.; Taylor, L. R. (1968). "High-Altitude Migration of Aphids in Maritime and Continental Climates". Journal of Animal Ecology. 37 (3): 713–722. doi: 10.2307/3084. JSTOR 3084. ^ Isard, Scott A.; Irwin, Michael E.; Hollinger, Steven E. (1990-10-01). "Vertical Distribution of Aphids (Homoptera: Aphididae) in the Planetary Boundary Layer". Environmental Entomology. 19 (5): 1473–1484. doi: 10.1093/ee/19.5.1473. ^ Hill, L. (2012). "The currant lettuce aphid, Nasonovia ribisnigri arrives in Tasmania: Part 1". Victorian Entomologist. 42 (2): 29–31. ^ Margaritopoulos, John T.; Kasprowicz, Louise; Malloch, Gaynor L.; Fenton, Brian (2009-05-11). "Tracking the global dispersal of a cosmopolitan insect pest, the peach potato aphid". BMC Ecology. 9: 13. doi: 10.1186/1472-6785-9-13. PMC 2687420. PMID 19432979. ^ a b Capinera, John L. (2008). Encyclopedia of Entomology. Springer Science & Business Media. pp. 193–194. ISBN 978-1-4020-6242-1. ^ Johnson, Christine; Agosti, Donat; Delabie, Jocques H.; Dumpert, Klaus; Williams, D. J.; von Tschirnhaus, Michael; Macshwitz, Ulrich (2001). "Acropyga and Azteca ants (Hymenoptera: Formicidae) with scale insects (Sternorrhyncha: Coccoidea): 20 million years of intimate symbiosis" (PDF). American Museum Novitates. 3335: 1–18. doi: 10.1206/0003-0082(2001)335<0001:AAAAHF>2.0.CO;2. ^ Russell, Louise M. (1968). "Studies on Fossil Aphids" (PDF). Bulletin of the Entomological Society of America. 14 (2): 139–140. doi: 10.1093/besa/14.2.139a. ^ a b c d e f Dixon, A. F. G. (1998). Aphid Ecology (2nd ed.). Chapman and Hall. ISBN 978-0-412-74180-7. ^ Von Dohlen, Carol D.; Moran, Nancy A. (2000). "Molecular data support a rapid radiation of aphids in the Cretaceous and multiple origins of host alternation". Biological Journal of the Linnean Society. 71 (4): 689–717. doi: 10.1111/j.1095-8312.2000.tb01286.x. ^ Chen, Rui; Favret, Colin; Jiang, Liyun; Wang, Zhe; Qiao, Gexia (29 September 2015). "An aphid lineage maintains a bark-feeding niche while switching to and diversifying on conifers". Cladistics. 32 (5): 555–572. doi: 10.1111/cla.12141. ^ Gullan, Penny J.; Martin, Jon H. (2009). "Sternorrhyncha". Encyclopedia of Insects (2nd ed.). ^ Rohdendorf, B. B., ed. (1991). Fundamentals of Paleontology. Volume 9. Arthropoda, Tracheata, Chelicerata. Smithsonian Institution and National Science Foundation. pp. 267–274. ^ Sorensen, J. T. (2009). "Aphids". In Resh, Vincent H.; Cardé, R. T. (eds.). Encyclopedia of Insects (2 ed.). Academic Press. pp. 27–31. ^ "Superfamily Aphidoidea, Latreille, 1802". Aphid: species file. Retrieved 3 February 2018. ^ Blackman, R. L.; Eastrop, V. F. (1994). Aphids on the World's Trees. An Identification and Information Guide. Wallingford: CAB International. ISBN 978-0-85198-877-1. ^ Granett, Jeffrey; Walker, M. Andrew; Kocsis, Laszlo; Omer, Amir D. (2001). "Biology and management of grape phylloxera". Annual Review of Entomology. 46: 387–412. doi: 10.1146/annurev.ento.46.1.387. ^ a b c d e f McGavin, George C. (1993). Bugs of the World. Infobase Publishing. ISBN 978-0-8160-2737-8. ^ "Phylogeny of Insects". What-When-How. Retrieved 21 February 2018. ^ Papasotiropoulos, Vassilis; Tsiamis, Georgios; Papaioannou, Charikleia; Kilias, George (2013). "A molecular phylogenetic study of aphids (Hemiptera: Aphididae) based on mitochondrial DNA sequence analysis". Journal of Biological Research-Thessaloniki. 20: 1–13. ^ Kim, Hyojoong; Lee, Seunghwan; Jang, Yikweon (September 2011). Moreau, Corrie S. (ed.). "Macroevolutionary Patterns in the Aphidini Aphids (Hemiptera: Aphididae): Diversification, Host Association, and Biogeographic Origins". PLOS One. 6 (9): e24749. doi: 10.1371/journal.pone.0024749. ^ Ortiz-Rivas, Benjamín; Martínez-Torres, David (2010). "Combination of molecular data support the existence of three main lineages in the phylogeny of aphids (Hemiptera: Aphididae) and the basal position of the subfamily Lachninae". Molecular Phylogenetics and Evolution. 55 (1): 305–317. doi: 10.1016/j.ympev.2009.12.005. ^ Clark, Marta A; Moran, Nancy A.; Baumann, Paul; Wernegreen, Jennifer J. (2000). "Cospeciation Between Bacterial Endosymbionts (Buchnera) and a Recent Radiation of Aphids (Uroleucon) and Pitfalls of Testing for Phylogenetic Congruence". Evolution. 54 (2): 517–25. doi: 10.1554/0014-3820(2000)054[0517:CBBEBA]2.0.CO;2. PMID 10937228. ^ Nováková, Eva; Hypša, Václav; Klein, Joanne; Foottit, Robert G; von Dohlen, Carol D.; Moran, Nancy A. (2013). "Reconstructing the phylogeny of aphids (Hemiptera: Aphididae) using DNA of the obligate symbiont Buchnera aphidicola" (PDF). Molecular Phylogenetics and Evolution. 68 (1): 42–54. doi: 10.1016/j.ympev.2013.03.016. PMID 23542003. ^ Chen, Rui; Wang, Zhe; Chen, Jing; Jiang, Li-Yun; Qiao, Ge-Xia (2017). "Insect-bacteria parallel evolution in multiple-co-obligate-aphid association: A case in Lachninae (Hemiptera: Aphididae)". Scientific Reports. 7. doi: 10.1038/s41598-017-10761-9. PMID 28860659. ^ a b c d e f g h Stroyan, Henry G. (1997). "Aphid". McGraw-Hill Encyclopedia of Science and Technology (8th ed.). ISBN 978-0-07-911504-1. ^ Mutti, Navdeep S. (2006). Molecular Studies of the Salivary Glands of the Pea Aphid, Acyrthosiphon pisum (Harris) (PDF) ( Ph.D. thesis). Kansas State University. ^ a b c van Emden, Helmut F.; Harrington, Richard (2017). Aphids as Crop Pests. CABI. pp. 189–190. ISBN 978-1-78064-709-8. ^ Powell, Glen; Tosh, Colin R.; Hardie, Jim (2005). "Host plant selection by aphids: Behavioral, Evolutionary, and Applied Perspectives". Annual Review of Entomology. 51 (1): 309–330. doi: 10.1146/annurev.ento.51.110104.151107. PMID 16332214. ^ Spiller, N. J.; Koenders, L.; Tjallingii, W. F. (1990). "Xylem ingestion by aphids – a strategy for maintaining water balance". Entomologia Experimentalis et Applicata. 55 (2): 101–104. doi: 10.1007/BF00352570. ^ a b Fisher, D. B. (2000). "Long distance transport". In Buchanan, Bob B.; Gruissem, Wilhelm; Jones, Russell L. (eds.). Biochemistry and Molecular Biology of Plants (4th ed.). Rockville, Maryland: American Society of Plant Physiologists. pp. 730–784. ISBN 978-0-943088-39-6. ^ Malone, M.; Watson, R.; Pritchard, J. (1999). "The spittlebug Philaenus spumarius feeds from mature xylem at the full hydraulic tension of the transpiration stream". New Phytologist. 143 (2): 261–271. doi: 10.1046/j.1469-8137.1999.00448.x. JSTOR 2588576. ^ Powell, Glen; Hardie, Jim (2002). "Xylem ingestion by winged aphids". Entomologia Experimentalis et Applicata. 104 (1): 103–108. doi: 10.1023/A:1021234412475. ^ a b c d Pompon, Julien; Quiring, Dan; Giordanengo, Philippe; Pelletier, Yvan (2010). "Role of xylem consumption on osmoregulation in Macrosiphum euphorbiae (Thomas)" (PDF). Journal of Insect Physiology. 56 (6): 610–615. doi: 10.1016/j.jinsphys.2009.12.009. PMID 20036244. Archived from the original (PDF) on 16 July 2011. ^ Kingsolver, J. G.; Daniel, T. L. (1995). "Mechanics of Food Handling by Fluid-Feeding Insects". In Chapman, R. F.; de Boer, Gerrit (eds.). Regulatory mechanisms in insect feeding. Springer. pp. 60–65. ^ Ashford, D. A.; Smith, W. A.; Douglas, A. E. (2000). "Living on a high sugar diet: the fate of sucrose ingested by a phloem-feeding insect, the pea aphid Acyrthosiphon pisum". Journal of Insect Physiology. 46 (3): 335–341. doi: 10.1016/S0022-1910(99)00186-9. PMID 12770238. ^ Wilkinson, T. L.; Ashfors, D. A.; Pritchard, J.; Douglas, A. E. (1997). "Honeydew sugars and osmoregulation in the pea aphid Acyrthosiphon pisum". Journal of Experimental Biology. 200 (11): 2137–2143. PMID 9320049. ^ Shakesby, A. J.; Wallace, I. S.; Isaacs, H. V.; Pritchard, J.; Roberts, D. M.; Douglas, A. E. (2009). "A water-specific aquaporin involved in aphid osmoregulation". Insect Biochemistry and Molecular Biology. 39 (1): 1–10. doi: 10.1016/j.ibmb.2008.08.008. PMID 18983920. ^ Dadd, R. H.; Mittler, T. E. (1965). "Studies on the artificial feeding of the aphid Myzus persicae (Sulzer) – III. Some major nutritional requirements". Journal of Insect Physiology. 11 (6): 717–743. doi: 10.1016/0022-1910(65)90154-X. PMID 5827534. ^ Buchner, Paul (1965). Endosymbiosis of animals with plant microorganisms. Interscience. ISBN 978-0-470-11517-6. ^ Whitehead, L. F.; Douglas, A. E. (1993). "A metabolic study of Buchnera, the intracellular bacterial symbionts of the pea aphid Acyrthosiphon pisum" (PDF). Journal of General Microbiology. 139 (4): 821–826. doi: 10.1099/00221287-139-4-821. ^ Febvay, Gérard; Liadouze, Isabelle; Guillaud, Josette; Bonnot, Guy (1995). "Analysis of energetic amino acid metabolism in Acyrthosiphon pisum: a multidimensional approach to amino acid metabolism in aphids". Archives of Insect Biochemistry and Physiology. 29 (1): 45–69. doi: 10.1002/arch.940290106. ^ Moran, Nancy A.; Jarvik, Tyler (2010). "Lateral transfer of genes from fungi underlies carotenoid production in aphids". Science. 328 (5978): 624–627. doi: 10.1126/science.1187113. PMID 20431015. ^ Altincicek, B.; Kovacs, J.L. ; Gerardo, N.M. (2012). "Horizontally transferred fungal carotenoid genes in the two-spotted spider mite Tetranychus urticae". Biology Letters. 8 (2): 253–257. doi: 10.1098/rsbl.2011.0704. PMC 3297373. PMID 21920958. ^ Valmalette, Jean Christophe; Dombrovsky, Aviv; Brat, Pierre; Mertz, Christian; Capovilla, Maria; Robichon, Alain (2012). "Light-induced electron transfer and ATP synthesis in a carotene synthesizing insect". Scientific Reports. 2: 579. doi: 10.1038/srep00579. PMC 3420219. PMID 22900140. ^ a b c Wang, C. L.; Siang, L. Y.; Chang, G. S.; Chu, H. F. (1962). "Studies on the soybean aphid, Aphis glycines Matsumura". Acta Entomologica Sinica. 11: 31–44. ^ a b van Emden, Helmut F.; Harrington, Richard (2017). Aphids as Crop Pests, 2nd Edition. CABI. pp. 81–82. ISBN 978-1-78064-709-8. ^ Von Dohlen, Carol; Moran, Nancy A. (2000). "Molecular data support a rapid radiation of aphids in the Cretaceous and multiple origins of host alternation". Biological Journal of the Linnean Society. 71 (4): 689–717. doi: 10.1006/bijl.2000.0470. ^ Moran, Nancy A. (1992). "The Evolution of Aphid Life Cycles". Annual Review of Entomology. 37: 321–348. doi: 10.1146/annurev.en.37.010192.001541. ^ a b Blackman, Roger L. (2008). "Stability and variation in aphid clonal lineages". Biological Journal of the Linnean Society. 11 (3): 259–277. doi: 10.1111/j.1095-8312.1979.tb00038.x. ^ a b Gullan, P. J.; Cranston, P. S. (2010). The Insects: An Outline of Entomology (4th ed.). Wiley. pp. 150–151. ISBN 978-1-118-84615-5. ^ a b c Hales, Dinah F.; Wilson, Alex C. C.; Sloane, Mathew A.; Simon, Jean-Christophe; Legallic, Jean-François; Sunnucks, Paul (2002). "Lack of Detectable Genetic Recombination on the X Chromosome During the Parthenogenetic Production of Female and Male Aphids". Genetics Research. 79 (3): 203–209. doi: 10.1017/S0016672302005657. ^ Nevo, Ettay; Coll, Moshe (2001). "Effect of nitrogen fertilization on Aphis gossypii (Homoptera: Aphididae): variation in size, color, and reproduction". Journal of Economic Entomology. 94 (1): 27–32. doi: 10.1603/0022-0493-94.1.27. PMID 11233124. ^ Jahn, Gary C.; Almazan, Liberty P.; Pacia, Jocelyn B. (2005). "Effect of nitrogen fertilizer on the intrinsic rate of increase of the rusty plum aphid, Hysteroneura setariae (Thomas) (Homoptera: Aphididae) on rice (Oryza sativa L.)" (PDF). Environmental Entomology. 34 (4): 938–943. doi: 10.1603/0046-225X-34.4.938. Archived from the original (PDF) on 2010-09-09. ^ Hughes, R. D. (1963). "Population Dynamics of the Cabbage Aphid, Brevicoryne brassicae (L.)". Journal of Animal Ecology. 32 (3): 393–424. doi: 10.2307/2600. JSTOR 2600. ^ Alford, David V. (2014). Pests of Fruit Crops: A Colour Handbook, Second Edition. CRC Press. pp. 71–72. ISBN 978-1-4822-5421-1. ^ Brisson, Jennifer A. (2010). "Aphid wing dimorphisms: linking environmental and genetic control of trait variation". Philosophical Transactions of the Royal Society B: Biological Sciences. 365 (1540): 605–616. doi: 10.1098/rstb.2009.0255. PMC 2817143. PMID 20083636. ^ a b Hooper-Bui, Linda M. (2008). "Ant". World Book Encyclopedia. ISBN 978-0-7166-0108-1. ^ Stadler, Bernhard; Dixon, Anthony F. G. (2005). "Ecology and Evolution of Aphid-Ant Interactions". Annual Review of Ecology, Evolution, and Systematics. 36 (1): 345–372. doi: 10.1146/annurev.ecolsys.36.091704.175531. ^ Wootton, Anthony (1998). Insects of the World. Blandford. ISBN 978-0-7137-2366-3. ^ a b Neary, John (1977). Insects and Spiders. Time-Life Books. pp. 78–79. ISBN 978-0-8094-9687-7. ^ Salazar, Adrián; Fürstenau, Benjamin; Quero, Carmen; Pérez-Hidalgo, Nicolás; Carazo, Pau; Font, Enrique; Martínez-Torres, David (2015). "Aggressive mimicry coexists with mutualism in an aphid". Proceedings of the National Academy of Sciences. 112 (4): 1101–1106. doi: 10.1073/pnas.1414061112. PMC 4313836. PMID 25583474. ^ Baumann, Paul; Moran, Nancy A.; Baumann, Linda (2006). "Bacteriocyte-Associated Endosymbionts of Insects". In Dworkin, Martin; Falkow, Stanley; Rosenberg, Eugene; Schleifer, Karl-Heinz; Stackebrandt, Erko (eds.). The Prokaryotes. pp. 403–438. doi: 10.1007/0-387-30741-9_16. ISBN 978-0-387-25476-0. ^ Douglas, A. E. (1998). "Nutritional Interactions in Insect-Microbial Symbioses: Aphids and Their Symbiotic BacteriaBuchnera". Annual Review of Entomology. 43 (1): 17–37. doi: 10.1146/annurev.ento.43.1.17. PMID 15012383. ^ Bodył, Andrzej; Mackiewicz, Paweł; Gagat, Przemysław (2012). "Organelle Evolution: Paulinella Breaks a Paradigm". Current Biology. 22 (9): R304–R306. doi: 10.1016/j.cub.2012.03.020. ^ Perez-Brocal, V.; Gil, R.; Ramos, S.; Lamelas, A.; Postigo, M.; Michelena, J.M. ; Silva, F. J.; Moya, A.; Latorre, A. (2006). "A Small Microbial Genome: The End of a Long Symbiotic Relationship?". Science. 314 (5797): 312–313. doi: 10.1126/science.1130441. ^ Mira, A.; Moran, Nancy A. (2002). "Estimating Population Size and Transmission Bottlenecks in Maternally Transmitted Endosymbiotic Bacteria". Microbial Ecology. 44 (2): 137–143. doi: 10.1007/s00248-002-0012-9. ^ Sakaki, Yoshiyuki; Shigenobu, Shuji; Watanabe, Hidemi; Hattori, Masahira; Ishikawa, Hajime (2000). "Genome sequence of the endocellular bacterial symbiont of aphids Buchnera sp. APS". Nature. 407 (6800): 81–86. doi: 10.1038/35024074. ^ Viñuelas, José; Calevro, Federica; Remond, Didier; Bernillon, Jacques; Rahbé, Yvan; Febvay, Gérard; Fayard, Jean-Michel; Charles, Hubert (2007). "Conservation of the links between gene transcription and chromosomal organization in the highly reduced genome of Buchnera aphidicola". BMC Genomics. 8 (1): 143. doi: 10.1186/1471-2164-8-143. ^ Moran, Nancy A.; Dunbar, Helen E.; Wilcox, Jennifer L. (2005). "Regulation of Transcription in a Reduced Bacterial Genome: Nutrient-Provisioning Genes of the Obligate Symbiont Buchnera aphidicola". Journal of Bacteriology. 187 (12): 4229–4237. doi: 10.1128/JB.187.12.4229-4237.2005. PMC 1151715. PMID 15937185. ^ Tsuchida, T.; Koga, R.; Meng, X. Y.; T. Matsumoto; T. Fukatsu (2005). "Characterization of a facultative endosymbiotic bacterium of the pea aphid Acyrthosiphon pisum". Microbial Ecology. 49 (1): 126–133. doi: 10.1007/s00248-004-0216-2. PMID 15690225. ^ Sakurai, M.; Koga, R.; Tsuchida, T.; Meng, X.-Y. ; Fukatsu, T. (2005). "Rickettsia Symbiont in the Pea Aphid Acyrthosiphon pisum: Novel Cellular Tropism, Effect on Host Fitness, and Interaction with the Essential Symbiont Buchnera". Applied and Environmental Microbiology. 71 (7): 4069–4075. doi: 10.1128/AEM.71.7.4069-4075.2005. PMC 1168972. PMID 16000822. ^ Ferrari, Julia; Scarborough, Claire L.; Godfray, H. Charles J. (2007). "Genetic variation in the effect of a facultative symbiont on host-plant use by pea aphids". Oecologia. 153 (2): 323–329. doi: 10.1007/s00442-007-0730-2. PMID 17415589. ^ Simon, J.-C.; Carre, S.; Boutin, M.; Prunier-Leterme, N.; Sabater-Munoz, B.; Latorre, A.; Bournoville, R. (2003). "Host-based divergence in populations of the pea aphid: insights from nuclear markers and the prevalence of facultative symbionts". Proceedings of the Royal Society B: Biological Sciences. 270 (1525): 1703–1712. doi: 10.1098/rspb.2003.2430. PMC 1691435. PMID 12964998. ^ Weldon, Stephanie R.; Oliver, Kerry M. (2016). The Mechanistic Benefits of Microbial Symbionts. Advances in Environmental Microbiology. Springer, Cham. pp. 173–206. doi: 10.1007/978-3-319-28068-4_7. ISBN 9783319280660. ^ Weldon, S. R.; Strand, M. R.; Oliver, K. M. (2013-01-22). "Phage loss and the breakdown of a defensive symbiosis in aphids". Proceedings of the Royal Society of London B: Biological Sciences. 280 (1751): 20122103. doi: 10.1098/rspb.2012.2103. PMC 3574403. PMID 23193123. ^ Oliver, K. M.; Moran, Nancy A.; Hunter, M. S. (2006). "Costs and benefits of a superinfection of facultative symbionts in aphids". Proceedings of the Royal Society B: Biological Sciences. 273 (1591): 1273–1280. doi: 10.1098/rspb.2005.3436. PMC 1560284. PMID 16720402. ^ a b Capinera, John (2011). Insects and Wildlife: Arthropods and their Relationships with Wild Vertebrate Animals. John Wiley & Sons. p. 536. ISBN 978-1-4443-5784-4. ^ van Emden, Helmut F.; Harrington, Richard (2017). Aphids as Crop Pests. CABI. pp. 229–230. ISBN 978-1-78064-709-8. ^ a b c Brust, Gerald E. (22 June 2006). "Early season aphid and thrips populations". University of Maryland, College Park. Archived from the original on 19 July 2011. Retrieved 18 October 2010. ^ Lamb, K. P. (1961). "Some effects of fluctuating temperatures on metabolism, development, and rate of population growth in the cabbage aphid, Brevicoryne brassicae". Ecology. 42 (4): 740–745. doi: 10.2307/1933502. JSTOR 1933502. ^ Jones, Margaret G. (1979). "Abundance of aphids on cereals from before 1973 to 1977". Journal of Applied Ecology. 16 (1): 1–22. doi: 10.2307/2402724. JSTOR 2402724. ^ Krupke, Christian; Obermeyer, John; O'Neil, Robert (2007). "Soybean aphid, a new beginning for 2007". Pest and Crop. Purdue University. 7. 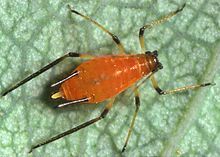 ^ "Why some aphids can't stand the heat". Science Daily. 23 April 2007. ^ Hughes, R.D. (1963). "Population dynamics of the cabbage aphid, Brevicoryne brassicae (L.)". Journal of Animal Ecology. 32 (3): 393–424. doi: 10.2307/2600. JSTOR 2600. ^ Suwanbutr, S. (1996). "Stable age distributions of lucerne aphid populations in SE-Tasmania" (PDF). Thammasat International Journal of Science and Technology. 1 (5): 38–43. Archived from the original (PDF) on 10 September 2008. ^ Ostlie, Ken (3 August 2006). "Spider Mites, Aphids and Rain Complicating Spray Decisions in Soybean" (PDF). Minnesota Crop eNews. University of Minnesota. Archived from the original (PDF) on 10 September 2008. ^ a b c Kutsukake, M.; Meng, X.Y. ; Katayama, N.; Nikoh, N.; Shibao, H.; Fukatsu, T. (2012). "An insect-induced novel plant phenotype for sustaining social life in a closed system". Nature Communications. 3: 1187–1193. doi: 10.1038/ncomms2187. PMC 3514493. PMID 23149732. ^ Preston-Mafham, Rod; Preston-Mafham, Ken (1993). The Encyclopedia of Land Invertebrate Behaviour. MIT Press. p. 281. ISBN 978-0-262-16137-4. ^ Gish, M.; Dafni, A.; Inbar, M. (2012). Heil, Martin (ed.). "Young Aphids Avoid Erroneous Dropping when Evading Mammalian Herbivores by Combining Input from Two Sensory Modalities". PLOS One. 7 (4): e32706. doi: 10.1371/journal.pone.0032706. PMC 3322135. PMID 22496734. ^ Kazana, Eleanna; Pope, Tom W.; Tibbles, Laurienne; Bridges, Matthew; Pickett, John A.; Bones, Atle M.; Powell, Glen; Rossiter, John T. (2007). "The cabbage aphid: a walking mustard oil bomb". Proceedings of the Royal Society B. 274 (1623): 2271–7. doi: 10.1098/rspb.2007.0237. PMC 2288485. PMID 17623639. ^ Vilcinskas, Andreas (2016). "Aphid Immunity.". Biology and Ecology of Aphids. CRC Press. p. 131. ^ Edwards, John S. (1966). "Defence by smear: supercooling in the cornicle wax of aphids". Nature. 211 (5044): 73–74. doi: 10.1038/211073a0. ^ Martinson, Candace (2008). "Aphid". World Book Encyclopedia. ISBN 978-0-7166-0108-1. ^ Way, M.J. (1963). "Mutualism between ants and honeydew-producing Homoptera". Annual Review of Entomology. 8: 307–344. doi: 10.1146/annurev.en.08.010163.001515. ^ Grasswitz, Tessa R.; Paine, Timothy D. (1992). "Kairomonal effect of an aphid cornicle secretion on Lysiphlebus testaceipes (Cresson) (Hymenoptera: Aphidiidae)". Journal of Insect Behavior. 5 (4): 447–457. doi: 10.1007/BF01058190. ^ Lenhart, Paul A.; Jackson, Kelly A.; White, Jennifer A. (2018). "Heritable variation in prey defence provides refuge for subdominant predators". Proceedings of the Royal Society B: Biological Sciences. 285 (1879): 20180523. doi: 10.1098/rspb.2018.0523. ^ "Aphid Parasitoids". University of Maryland. Retrieved 29 April 2018. ^ Havelka, Jan; Tomanović, Željko; Kavallieratos, Nickolas G.; Rakhshani, Ehsan; Pons, Xavier; Petrović, Andjeljko; Pike, Keith S.; Starý, Petr (2012-05-01). "Review and Key to the World Parasitoids (Hymenoptera: Braconidae: Aphidiinae) of Aphis ruborum (Hemiptera: Aphididae) and Its Role as a Host Reservoir". Annals of the Entomological Society of America. 105 (3): 386–394. doi: 10.1603/an11108. ^ a b c Flint, M.L. (July 2013). "Aphids". UC IPM. Archived from the original on 2018-04-09. Retrieved 6 February 2018. ^ Gibson, R. W.; Pickett, J. A. (1983). "Wild potato repels aphids by release of aphid alarm pheromone". Nature. 302 (5909): 608–609. doi: 10.1038/302608a0. ^ Gibson, R. W. (1971). "Glandular hairs providing resistance to aphids in certain wild potato species". Annals of Applied Biology. 68 (2): 113–119. doi: 10.1111/j.1744-7348.1971.tb06448.x. ^ United States Department of Agriculture (2003). Studies on the Chemical and Biological Properties of Coumestrol and Related Compounds. US Government Printing Office. pp. 47–67. ^ Gillman, Daniel H. (2005). "Sooty mold" (PDF). University of Massachusetts Amherst. Retrieved October 18, 2010. ^ Reynolds, Hannah T.; Volk, Tom (September 2007). "Scorias spongiosa, the beech aphid poop-eater". Tom Volk's Fungus of the Month. University of Wisconsin–La Crosse. Archived from the original on July 30, 2010. Retrieved October 18, 2010. ^ Dik, A. J.; van Pelt, J. A. (1992). "Interaction between phyllosphere yeasts, aphid honeydew and fungicide effectiveness in wheat under field conditions". Plant Pathology. 41 (6): 661–675. doi: 10.1111/j.1365-3059.1992.tb02550.x. ^ Choudhury, Dhrupad (1985). "Aphid honeydew: a re-appraisal of the hypothesis of Owen and Wiegert". Oikos. 45 (2): 287–290. doi: 10.2307/3565718. JSTOR 3565718. ^ Stern, D. L.; Foster, W. A. (1996). "The evolution of soldiers in aphids". Biological Reviews of the Cambridge Philosophical Society. 71 (1): 27–79. doi: 10.1111/j.1469-185X.1996.tb00741.x. PMID 8603120. ^ Choe; Jae C.; Crespi, Bernard J. (1997). The Evolution of Social Behaviour in Insects and Arachnids. Cambridge University Press. pp. 150–152. ISBN 978-0-521-58977-2. ^ Pike, N.; Richard, D.; Foster, W.; Mahadevan, L. (2002). "How aphids lose their marbles". Proceedings of the Royal Society B: Biological Sciences. 269 (1497): 1211–5. doi: 10.1098/rspb.2002.1999. PMC 1691028. PMID 12065036. ^ a b van Emden, Helmut F.; Harrington, Richard (2017). Aphids as Crop Pests. CABI. pp. 196–198. ISBN 978-1-78064-709-8. ^ Shulman, Sidney (1967-01-01). "Allergic Responses to Insects". Annual Review of Entomology. 12 (1): 323–346. doi: 10.1146/annurev.en.12.010167.001543. ^ Pundt, Leanne (2011). "Managing Aphids in the Greenhouse". University of Connecticut College of Agriculture, Health, and Natural Resources. Archived from the original on 2018-02-18. Retrieved 20 February 2018. ^ Cranshaw, W.S. (March 2008). "Insect Control: Soaps and Detergents". University of Colorado. Retrieved 6 February 2018. ^ Ubl, J.B. (July 2009). "Insecticidal Soaps for Garden Pest Control". Clemson University. Retrieved 6 February 2018. ^ Jaronski, S. T.; Mascarin, G. M. (2017). Lacey, Lawrence (ed.). Mass Production of Fungal Entomopathogens. Microbial control of insect and mite pests : from theory to practice. Academic Press. pp. 141–155. ISBN 978-0-12-803527-6. ^ Steinkraus, Donald C. (2006). "Factors affecting transmission of fungal pathogens of aphids". Journal of Invertebrate Pathology. 92 (3): 125–131. doi: 10.1016/j.jip.2006.03.009. ^ Lady Beetle Releases for Aphid Control: How to Help Them Work. Clark, J.K., University of California Davis, June 2011. ^ Beale, M. H.; Birkett, M. A.; Bruce, T. J. A.; Chamberlain, K.; Field, L. M.; Huttly, A. K.; Martin, J. L.; Parker, R.; Phillips, A. L.; Pickett, J. A.; Prosser, I. M.; Shewry, P. R.; Smart, L. E.; Wadhams, L. J.; Woodcock, C. M.; Zhang, Y. (2006). "Aphid alarm pheromone produced by transgenic plants affects aphid and parasitoid behavior". Proceedings of the National Academy of Sciences. 103 (27): 10509–10513. doi: 10.1073/pnas.0603998103. PMC 1502488. PMID 16798877. ^ Pickett, J. A.; Wadhams, L. J.; Woodcock, C. M.; Hardie, J. (1992). "The Chemical Ecology of Aphids". Annual Review of Entomology. 37 (1): 67–90. doi: 10.1146/annurev.en.37.010192.000435. ^ Marren, Peter; Mabey, Richard (2010). Bugs Britannica. Chatto & Windus. pp. 191–194. ISBN 978-0-7011-8180-2. Look up aphid in Wiktionary, the free dictionary. Wikisource has the text of the 1911 Encyclopædia Britannica article Aphides. Wikimedia Commons has media related to Aphidoidea.